LeBron James and Steph Curry are among the finalists but there’s no Kobe Byrant. 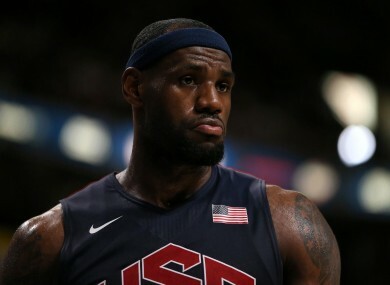 USA BASKETBALL HAS announced the 30 finalists for the Rio Olympic Men’s Basketball Team, with three-time Olympic medallists LeBron James and Carmelo Anthony highlighting the list. The official 12-member roster will be announced later this year. “It seems like I say this each time we have to narrow down a roster, but I am struck by the remarkable commitment the players in the USA Basketball National Team program continue to display and the enthusiasm they have for representing their country,” USA Basketball chairman Jerry Colangelo said. The coaching staff will be led by Duke University’s Naismith Hall of Fame coach Mike Krzyzewski. He will be supported by assistant coaches Jim Boeheim, Tom Thibodeau and Monty Williams. Lakers star Kobe Bryant on Saturday ended speculation about his potential participation in the 2016 Olympics by announcing that he will not play for Team USA this August as he prepares to retire from the NBA at the end of what is his 20th season. The US will look to earn the gold medal once again after capturing it for the 14th time at the London Olympics in 2012. The 30 finalists representing 17 NBA teams: LaMarcus Aldridge (Spurs); Carmelo Anthony (Knicks); Harrison Barnes (Warriors); Bradley Beal (Wizards); Jimmy Butler (Bulls); Mike Conley (Grizzlies); DeMarcus Cousins (Kings); Stephen Curry (Warriors); Anthony Davis (Pelicans); DeMar DeRozan (Raptors); Andre Drummond (Pistons); Kevin Durant (Thunder); Kenneth Faried (Nuggets); Rudy Gay (Kings); Paul George (Pacers); Draymond Green (Warriors); Blake Griffin (Clippers); James Harden (Rockets); Gordon Hayward (Jazz); Dwight Howard (Rockets); Andre Iguodala (Warriors); Kyrie Irving (Cavaliers); LeBron James (Cavaliers); DeAndre Jordan (Clippers); Kawhi Leonard (Spurs); Kevin Love (Cavaliers); Chris Paul (Clippers); Klay Thompson (Warriors); John Wall (Wizards); and Russell Westbrook (Thunder). Email “US basketball team name 30-man list for Rio Olympics roster and it's ridiculously talented”. Feedback on “US basketball team name 30-man list for Rio Olympics roster and it's ridiculously talented”.